The ranges of Aravallis are the guardian of the beautiful place which is called Udaipur. The city is a part of state of India ‘Rajasthan’ which is known for its colorful and lively life. Also goes by the name of ‘City of Lakes’ Udaipur is the administrative headquarters and also municipal council of the town. The city witness thousands of travellers every year and for them the city has many accommodation places that are listed among premium hotels in the city. 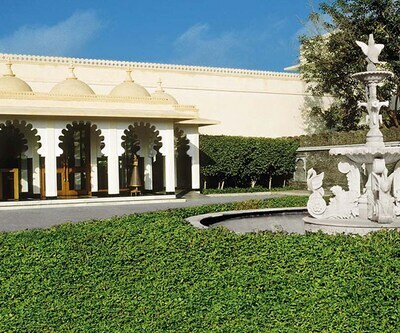 the oberoi udaivilas is one of the best 5 star hotels in Udaipur. 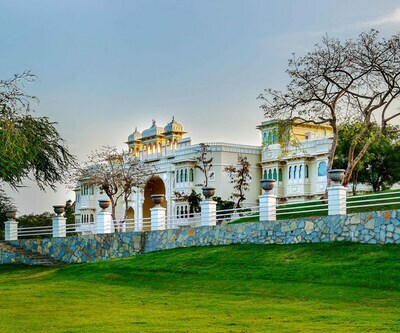 Spread over 50 acres, this resort has 87 rooms which offer beautiful view of the indigenous trees and expansive gardens. The premium property is 6 km from Railway Station, 26 km from Maharana Pratap Airport and all the major tourist attractions like City Palace and Saheliyon Ki Bari are located within a radius of 5 km. Guest can enjoy the delicious cuisines while cruising on the boat in the Lake Pichola. Guest can also enjoy private dinner near the lakeside. The hotel also offers spa, swimming pool and the therapies. The Ananta Resort Udaipur is another one of the 5 star Udaipur hotels. 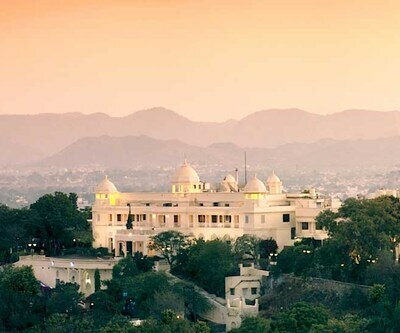 Monsoon Palace, Jag Mandir Palace is near from this hotel. This resort has 242 modern spacious rooms with the best amenities. This resort has an on-site lounge and bar ‘Floats’ where guest can enjoy mock-tails and cocktails. ‘Oasis’ is a multi-cuisine restaurant which Indian, Chinese and Continental cuisines. 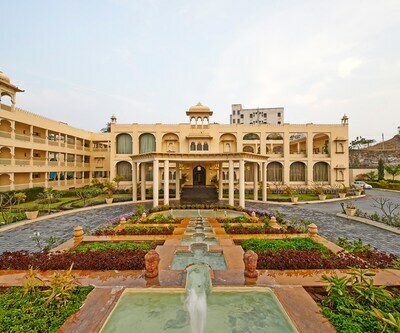 This resort has a spacious banquet hall, conference hall and meetings rooms. The premium property is located close to all major modes of transportation including Bus Stand (8km), Railway Station (10km) and Airport (30km). 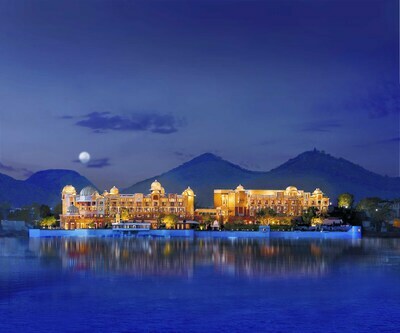 Some other 5 star hotels in Udaipur are The Leela Palace and Radisson Blue Resort and Spa, when on one hand The Leela Palace feature 72 Grand Heritage Lake view rooms with balcony and 8 suites. ‘Sheesh Mahal’ restaurant serves Indian specialties. Guest can enjoy world’s best cuisines at the ‘Dining room’. ‘Library Bar’ serves a variety of cocktails and mock-tails. This resort has a swimming pool, spa, massage centre and fitness center. On other hand Radisson Blue Resort and Spa is situated on the banks of Fateh Sagar Lake. This resort has 240 ritzy rooms and suites with a lake view. ‘Rajwada’ is an Indian cuisine restaurant which is famous for Rajasthani Thalis. ‘Jal Darshan’ is a bar overlooking the pool where guest can enjoy cocktails and mock-tails along with international music and folk dance. ‘Aangan’ is a lobby lounge which serves tea, coffee and other beverages along with a picturesque view of the Fateh Sagar Lake. Is The Lalit Laxmi vilas palace has swimming pool in the hotel? No they dont have a swimming pool because its a hertiage property on elevated hill so they didnot get permission by local authorities to construct a pool but overall a grand hotel. How far is TatSaraasa Resort & Spa, Udaipur from city? Its 14 Km far from city Center. 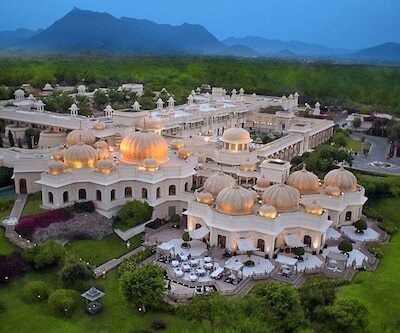 I want to visit The Ananta Udaipur for two nights for my anniversary in December. I want to know if there is balcony available with deluxe rooms? Yes having balcony with deluxe rooms.